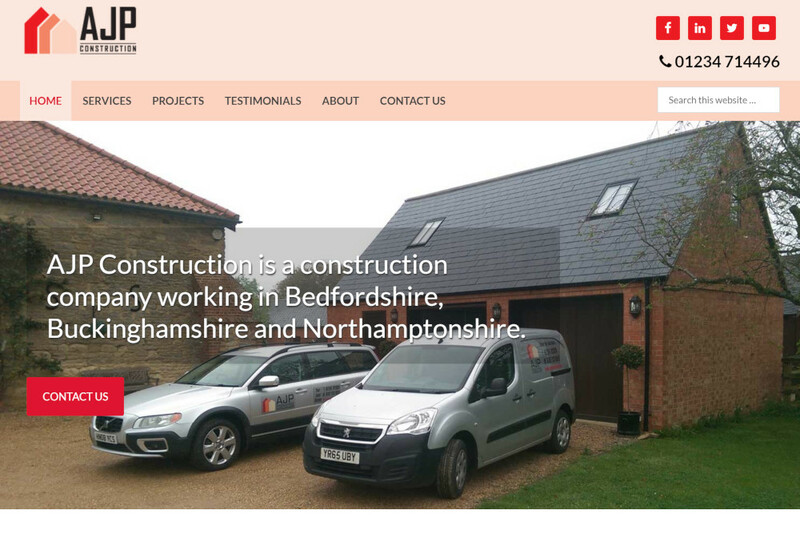 AJP Construction is a construction company based in Olney, that specialises in new builds, extensions and renovations. It has a combined experience of over 65 years in the building industry. They are based in Bedfordshire, Buckinghamshire and Northamptonshire. The old website was dated and it wasn’t possible to edit any of the content or add new projects after they were completed. Contact information was hard to find and although there was a contact form, it was awkward to use, especially on mobile devices. The site was generally difficult to read on mobile devices. Rebuild the site from scratch on WordPress so that the client can add projects, before and after photo galleries, videos, and client testimonials. Provide a new mobile friendly design, while preserving brand colours and existing logo. Include a search option, so that clients and past projects can be accessed quickly and easily. Add social media links in the page header, along with a clearly visible phone number. Automatically display recent projects on the home page as they are added. Allow the client and site visitors to easily share projects directly from the site, using social sharing icons at the top of every project page. Add testimonials to any product or service page. Allow site visitors to view projects by project type using a dropdown. Add editable team bios to the about page. Include a much improved contact form on the contact page, making it much easier for site visitors to make enquiries. I met Chris at a networking event about a year ago and we had a few meetings regarding other business opportunities. I then asked him if he could revamp our website, which he has done very successfully. Not only that, he made things very simple for me to understand that has enabled me to make changes to our website as and when we need to. He is very helpful and is always on hand if you need him. I will recommend him to my friends.